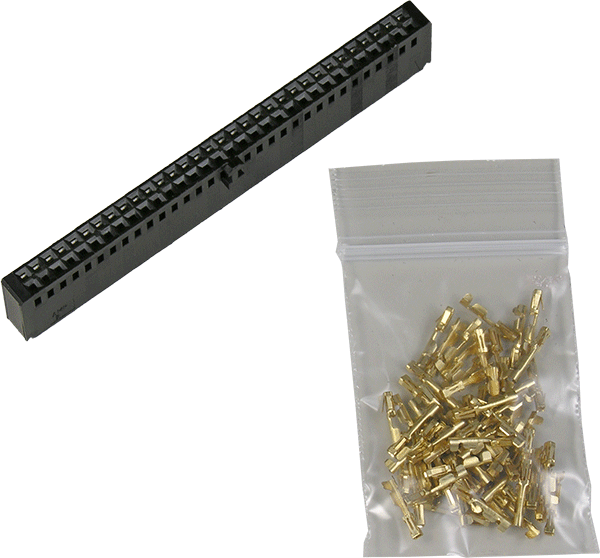 Consists of a 64-pin socket body with open cavities and a kit of 65 gold-plated female crimp pins (64 plus 1 extra) for 22-26 gauge wire. When assembled, this socket plugs into any of the 64-pins headers used on CableEye testers or expansion modules and would be employed when building rugged custom interfaces where IDC flat cable would be inappropriate, or where test voltages up to 1500vDC or 1000vAC must be sustained. Crimp pins suitable for other gauge sizes or with different plating are available; contact us for information. Note: appropriate crimping tool required!